Belize’s Atolls consistently ranks among the world’s top dive locations and Turneffe Flats is ideally located to take advantage of Belize’s very best Scuba diving. 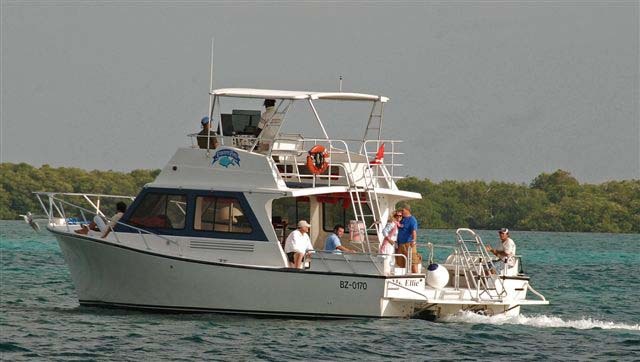 Their extraordinary dive program offers 18 dives each week including a day of diving at Lighthouse Reef and the Blue Hole, weather permitting. More than 60 dive sites around the Turneffe Atoll are easily accessed; and are within an hour’s boat ride to the Blue Hole. At Turneffe Flats, they offer true valet dive service. After putting your dive gear on your porch the first morning, it is washed and set up on the dive boat the remainder of the week. 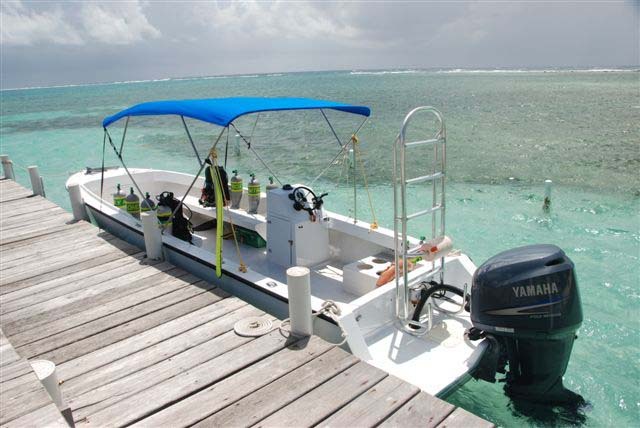 All you need to do is walk to the dive boat after a delicious breakfast and head for one of the exceptional dive sites. They emphasize personalized service for a limited number of divers, generally no more that twelve on their Pro 48. The superb dive team is led by Belize’s Tour Guide of the Year, Alex Edwards, and they make every effort to ensure that your stay at this tropical paradise is as comfortable and carefree as possible. They recognize that a dive vacation is more than just diving, and they do their best to make sure your entire experience is something special. While diving throughout the Turneffe Atoll, you will see a variety of hard and soft corals as well as all of the Caribbean tropicals, eagle rays, sharks, turtles, dolphins, moray eels, and occasionally a whale shark in addition to large schools of permit, horse eye jacks and dog snapper. Turneffe Flats offers the advantages of nitrox diving as well as the ability for divers to become “nitrox certified” with their Dive Instructors. There is a $10 per fill charge for Nitrox. 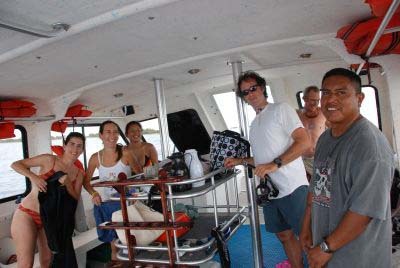 Following a great breakfast, a typical dive day begins at 8:00 and includes three boat dives. Depending on the dive location, you either return to the resort for lunch or pack a lunch. Travel to the dive sites takes from ten minutes to an hour with the longest trip to the Blue Hole. On Blue Hole day you leave between 7:00 and 7:30 AM which often makes it possible to be the first boat at the site. Their weekly night dive is usually on Wednesday evening, and will generally be conducted at the Elbow, at the Southern tip of Turneffe, later in the week. On Fridays, they do two or three dives depending on divers flights the following day. As the largest and most biologically diverse coral atoll in the Caribbean, Turneffe offers spectacular underwater terrain including spur and groove formations, sandy ledges and sheer walls providing spectacular dive sites suited for every level of diver. The location, near the middle of the seaward side of the Atoll, allows good access to all of Turneffe’s dive sites allowing the dive guests the opportunity to dive the best possible sites each day regardless of weather. The Eastern side of Turneffe is protected by 35 miles of reef. It shelves gradually to about 60 feet where spur and groove formations meet the wall. Nutrients from the mangroves are dispersed to the reef by the tides causing large concentrations of feeding fish to congregate. On the West side of the Atoll, large mangroves stands provide shelter from the trade winds and heavy seas. A gently sloping bottom lies at 30-50 feet with large coral formations covering the white sand bottom. The reduced wave action allows sponges and soft corals to grow magnificently and sea feathers of 5 feet are common. The North side of Turneffe is sometimes effected by trade wind swells but on the calmer days you can explore these mostly untouched dive sites. Schools of mutton snapper, Atlantic spadefish and permit hover 80 feet above the sea floor and blue runners make close passes, apparently attracted by the bubbles of the strange “Neoprene-clad creatures”. Turneffe’s Southern point offers a variety of popular dive sites featured in many of the Belize dive guides. The Elbow is probably the best known site here with the ocean current sweeping over the deep reef to attract schools of pelagic fish. As you travel up the Southwest or Southeast sides of the atoll, dive sites vary from patch reef nurseries with dramatic coral formations to steep drop-offs. Full Open Water Certifications as well as Rescue Diver and Dive Master certifications are available with prior arrangements.